On 08.01.2015 JumpsUSA.com and EquiDepot.com decide to murge and join their forces under JumpsUSA.com banner and website. Since 2009, Equidepot.com was one of the most dynamic Equestrian supplier for the Europeen market and it is very exciting for JumpsUSA.com to have EquiDepot.com as part of its team. It is my great pleasure to welcome all Equidepot.com customers and friends to JumpsUSA world. The AluStylepro Horse Jump Standards. The best Standard on the market !!!!!! It has the strength, rigidity and durability of aluminum. Without the maintenance, damage risk and the high price…. It has the weight and structural properties of wood. Without the maintenance, cracking, painting/staining and environmental impact. Double-wall PVC makes it safe and maintenance Free. Without the blowing over problem of light weight PVC. 40<50lbs. on the market without the inconveniences! that increases the stability and wall thickness up to 9mm at all the critical structural points. Jumps USA is proud to have been the official supplier at the 114's Trophies International Horse Show Jumping in Tunisia. Congratulations to all the winners at the show! Welcome, JumpsUSA.com, The world leader in PVC Horse Jumps and Dressage Arenas. 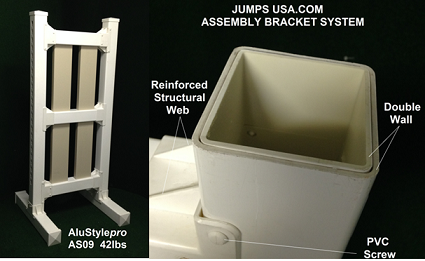 Started in 1995 JumpsUSA as been the innovator in the PVC Jumps Industries same with Dressage Arenas. Since we are the manufacturer, we control the quality of our products and we strive making sure you receive your order in a timely manner. We use the highest grade of PVC in all our Products meaning thicker material than most jumps companies. The reason why we started with PVC material used for our horse jumps and dressage arenas is; the finished quality look with the maintenance free aspect. 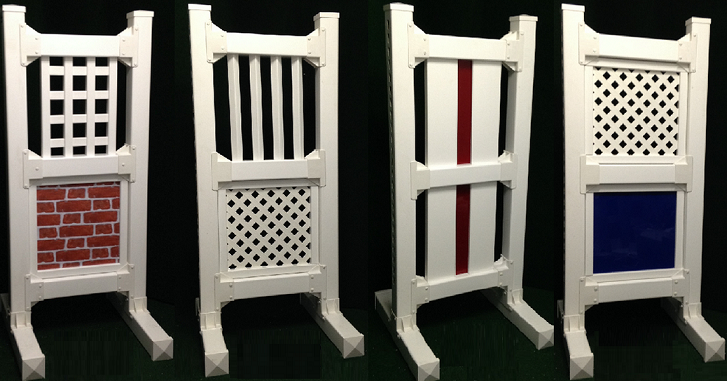 Since our pvc horse jumps are made with a lightweight material, we are able to ship easily at a very competitive price which is why we are able to include shipping cost into our product price.